Let the family feud begin. The Children and Financial Dependence survey, conducted on behalf of FP Canada posed a series of scenarios to parents regarding their children’s post-secondary education, home buying and financial independence. According to the results, nearly 4-in-10 of those with millennial children (38%) say those children are still financially dependent on them while one third of parents say their millennial kids are still causing a financial strain on the parents. Additionally, assisting their millennial kids with post-secondary costs will postpone the retirement of 33% of respondents and prevent 32% from paying off their debt. The survey also found that men (44%) are significantly more likely than women (32%) to assist their children of all ages with their first home purchase. That gender divide also extends to tapping into their home equity—with 22% of men (vs 12% of women) willing to pull from their own home assets to assist their kids with their first home purchase. Finally, generational differences were revealed when it came to providing financial support in adulthood to millennial children (over 18) vs centennial children (under 18). 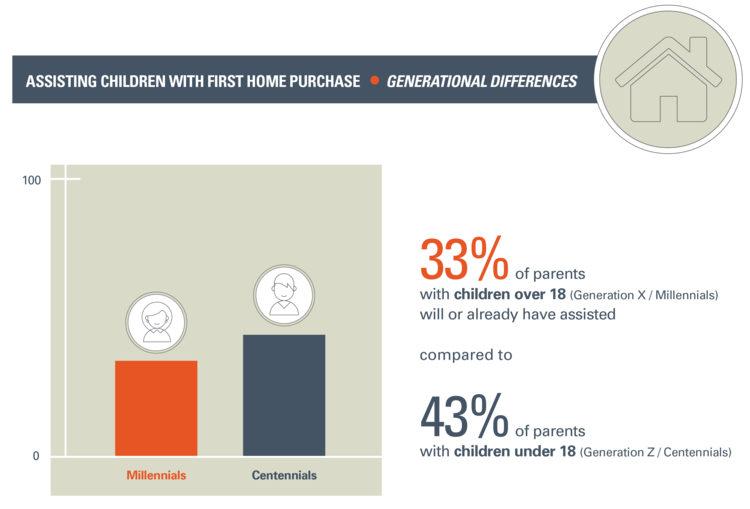 Parents of centennial children were more likely (43%) than parents of millennial children (33%) to help their children purchase their first home. The full results of FP Canada's Adult Children and Financial Dependence survey can be found here. A survey of 1527 Canadians was completed online between July 31 to August 3, 2017 using Leger’s online panel, LegerWeb. A probability sample of the same size would yield a margin of error of +/-2.5%, 19 times out of 20. Leger’s online panel has approximately 475,000 members nationally – with between 10,000 and 20,000 new members added each month, and has a retention rate of 90%. For more information on balancing your financial priorities and supporting your adult children, watch Loaning money to your children and read The new financial planning landscape for Boomers and 4 ways to get your adult children on the road to financial independence.